A Paul Mitchell Beauty School stylist cuts a student’s hair. Photo by Ben Taylor. Real Business experience, or RBE, is a one semester business class offered at Butler University. In RBE students are to come up with a project that is feasible and then project that project across the university. This consist of focusing on the formation, structure, funding, marketing and operations of a small business startup. Josh Hall, a sophomore marketing major taking Real Business Experience and the CEO of the project, brainstormed the idea for his business project over winter break. He wanted something different than just selling a product on campus, which is what RBE projects have done in the past. Then it hit him — Butler’s campus needed a service that would benefit the students and community. “I wanted to bring student life back to campus,” Hall said. The cosmetologists for Barbers 2 Butler are students from Paul Mitchell’s Beauty School. They can cut hair for men and women as well as style hair. Audrey Marjamaa, a first-year biomedical engineering and biochemistry double major, and Madeline Coffey, a first-year biology major, both needed haircuts but but did not have a car on campus. Both said they believed this was a convenient opportunity. The five students part of the project took out a $300 Butler RBE loan, which is a sum of money approved by the RBE coordinator that is used for the project, to help pay for the supplies needed. The profits made from Barber 2 Butler will go back to paying this loan while 25 percent of earnings will go to Paul Mitchell Beauty School and Coalition to Abolish Slavery and Trafficking, a nonprofit that the beauty school partners with to end modern slavery and human trafficking. Any leftover funds will go back into the RBE project to potentially keep the service on campus. Natalia Lascano, a sophomore international business and marketing major, is the vice president of operations. In their first day of business, the group saw 16 clients and made $250. 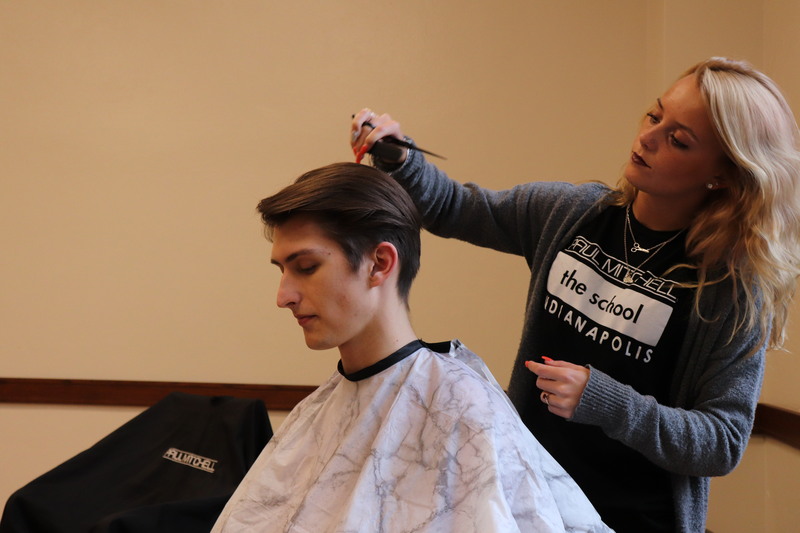 “As far as we know, nothing this big has ever been done on campus and we hope to change the environment of Butler in general,” said Michael Uretzky, a sophomore marketing major and chief financial officer of Barbers 2 Butler. Men’s haircuts are $15 while women’s are $25. Card and cash are accepted. The next opportunity to get a haircut will be April 13 and 20 from 11 a.m. to 5 p.m. in Jordan Hall Room 305.